Mountain View Villas, Real Estate by Suriyajan Properties Co., Ltd.
Mountain View Villas by Suriyajan Properties Co., Ltd. Situated in a great location for fast access to all parts of Phuket Island , within easy reach of Bangtao and Surin beaches and yet tucked away next to a small fruit orchard in Cherngtalay. Conveniently located near the 5-star Laguna complex of hotels and resorts with its wide range of pubs, restaurants, boutiques, shopping complex and golf course and within easy reach of the airport. A 3 bedroom luxury mountain view home having a swimming pool with Jacuzzi and beautifully constructed with sandstone, marble and teak wood finish. The property is situated in a small rambutan orchard surrounded by lush vegetation offering additional privacy and quietness. A fenced garden area with an ornamental gate makes it safe for children and the easily maintained garden is delightful. This house has been designed for your comfort. 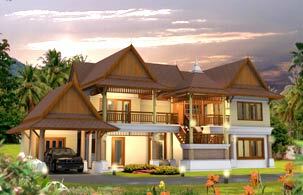 Exceptional quality and beautiful construction using the finest materials. Tiles and wood feature throughout the house, giving it that elegant touch. Kitchen and bathroom appliances in this luxurious home are of European standard.